Is it the CHURCH? Is it something "set up in the hearts of men?" Is it the British Empire? Is it "the Good within you?" Is it "the Millennium?" Each of these is widely taught — yet none is right! The shocking TRUTH is here made PLAIN! A prominent evangelist said to a world-wide radio audience that the Gospel of the Kingdom of God is not for us today. Some denominations proclaim a "Gospel of Grace;" some what they call a "Gospel of Salvation;" some a gospel about Christ; some a social gospel; some the "Science of Mind" or "Religious Science." This truth is not merely surprising — it is shocking — staggering! Yet it is truly GOOD NEWS — the most glorious GOOD NEWS ever to enter human consciousness! What is the one and only Gospel of Jesus Christ? THE WORLD DOES NOT KNOW! It has not been preached for 18½ centuries, strange as that may seem. Look into your BIBLE. Look at it from the very beginning! Because they rejected Christ's Gospel 1900 years ago, the world had to supplant something else in its place. They had to invent a counterfeit! So we have heard the Kingdom of God spoken of as merely a pretty platitude — a nice sentiment in human hearts — reducing it to an ethereal, unreal NOTHING! Others have misrepresented that the "CHURCH" is the Kingdom. Others confuse it with a "millennium." Still others have, in our century, claimed the British Empire is the Kingdom of God. How DECEIVED CAN THIS WORLD GET? First, God's purpose was to reveal to this worldruling human king that there is a GOD in heaven — that GOD IS SUPREME RULER over all nations, governments, and kings — that God RULES THE UNIVERSE! This Chaldean king knew only about the many pagan demon gods. He knew nothing of the true living ALMIGHTY God. Like people and rulers, even today, he did not know that GOD is the living, REAL, active, RULING and GOVERNING PERSONAGE who actually and literally governs not only what is on earth, but the UNIVERSE ENTIRELY! The whole purpose of this DREAM was to reveal, GOD'S GOVERNMENT — the fact that God RULES the truth of THE KINGDOM OF GOD — the very thing that is the one and only true GOSPEL OF JESUS CHRIST! And, secondly, to reveal — preserved in writing for us TODAY — what is to happen "in the latter days" — actually within the next two decades — THIS LAST HALF OF THE 20TH CENTURY! Read, in your own Bible, verses 28 through 35. In his dream, this king had seen a vast statue larger than any image or statue ever built by man — so tremendous it was terrifying, even in a dream. Its head was of fine gold, its breast and arms of silver, the belly and thighs of brass, legs of solid iron, feet a mixture of iron and clay. This, then, is GOD'S interpretation. It is decidedly not Herbert W. Armstrong's interpretation. Men ought never to interpret the Bible. The Bible gives us GOD'S OWN INTERPRETATION! Here it is: "Thou, 0 king, art a king of kings:" — he was the first real WORLD RULER over a world empire! "...for the God of heaven hath given thee a kingdom, power, and strength, and glory." God was revealing Himself to this human world — dictator as the MOST HIGH Ruler over all. "And in the days of these kings,..." it is here speaking of the ten toes, part of iron and part of brittle clay. This, by connecting the prophecy with Daniel 7, and Revelation 13 and 17, is referring to the new UNITED STATES OF EUROPE which is now forming, out of the European Common Market, before your very eyes! Revelation 17: 12 makes plain the detail that it shall be a union of TEN KINGS OR KINGDOMS which (Rev. 17:8) shall resurrect the old ROMAN EMPIRE. "...shall the God of heaven set up a kingdom, which shall never be destroyed...but it shall break in pieces and consume all these kingdoms, and it shall stand forever!" Now here we have described FOUR universal world-Empires — the only four that ever existed! Revelation 13 and 17 show that, after the fall of the original Roman Empire, there would be ten revivals — SEVEN of which would be ruled over by a Gentile CHURCH — the "daughter" of ancient BABYLON — a Church claiming to be Christian, but actually named by God "MYSTERY BABYLON the Great" — or, more plainly, BABYLONIAN MYSTERIES! Six of those have come and gone. The seventh is now forming — the last, final, brief resurrection of the Roman Empire by ten European groups or nations. These are the ten toes of iron and clay mixed. In their days — and they shall last but a very short space, possibly no more than two to three-and-a-half years — shall the GOD OF HEAVEN SET UP A KINGDOM. Compare with Revelation 17. Here is pictured a Church. Not a small church — a GREAT Church. She rules over "many waters" (Verse 1) which are described in verse 15 as different nations speaking different languages. She posed as The Church of GOD — which Scripture says (Eph. 5:23; Rev. 19-7; Mat. 25:1-10, etc., etc.) is the affianced "bride" of CHRIST, to be spiritually MARRIED to Him at His second COMING. When Christ comes, He is coming as KING of kings, ruling the whole earth (Rev. 19:11-16); and HIS KINGDOM — the KINGDOM OF GOD said Daniel, is to CONSUME all these worldly kingdoms. Revelation 11:15 states it in these words: "The kingdoms of this world are become THE KINGDOMS OF OUR LORD, AND OF HIS CHRIST; and He shall reign for ever and ever!" Jesus Christ was BORN to be a KING — a RULER! When He stood, on trial for His life, before Pilate, "Pilate therefore said unto Him, Art thou a King then? Jesus answered, Thou sayest that I am a King. To this end was I born, and for this cause came I into the world." But Jesus also said to Pilate: "My Kingdom is not of this world" (John 18:37, 36). His Kingdom is of THE WORLD TOMORROW! Have you not read what the angel proclaimed to Mary, the mother of Jesus, prior to His birth? Jesus told Pilate He was born to become a KING. The angel of God said to Mary: "... thou shalt conceive in thy womb, and bring forth a son, and shalt call His name JESUS. He shall be great, and shall be called the Son of the Highest: and the Lord God shall give unto Him the THRONE of His father David: and He shall reign over the House of Jacob forever, and of His Kingdom there shall be NO END" (Luke 1:31-33). These Scriptures tell you PLAINLY that GOD is supreme RULER. They tell you in plainest language that Jesus was born to be a KING — that He is going to RULE ALL NATIONS OF THE EARTH that His Kingdom shall rule eternally. Notice! "Jesus answered and said unto him, Verily, verily, I say unto thee, Except a man be born again, he cannot see the Kingdom of God" (Verse 3 — John 3). Yes, notice! The Kingdom of God is something that CAN be seen, but only by those who have been "born again." It is something others cannot see! 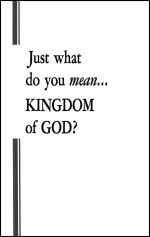 Read the booklet "Just What Do You MEAN - BORN AGAIN!" What do you think the "church" is? Is it the building? Flesh and blood people can and do enter buildings and cathedrals called "churches." Is it the converted PEOPLE? Flesh and blood people can and DO enter into the membership of any group of PEOPLE that may call itself the church. But flesh and blood cannot enter the Kingdom of GOD — so the CHURCH is not the Kingdom of God! Is it the "god within you"? No, it is not something that was born inside of man, or has ever entered into man — it is something man may enter after he is "born again." What about the British Empire? Well, I have been pretty well over the British Isles, Canada and Australia — and all of the multi-thousands I have seen there were flesh-and-blood humans. They did enter The British Empire — but they cannot enter the Kingdom of God, in their present flesh-and-blood life. So the British Empire cannot be the Kingdom of God. But, someone misunderstanding the Scripture may ask, "Didn't Jesus Himself say that the Kingdom of God is 'within you'?" In the 17th chapter of Luke, verse 21, King James translation, is a MISTRANSLATION which has led some to suppose the Kingdom of God is some thought or feeling or sentiment within man. He was speaking to the unconverted, carnal, hypocritical, lying Pharisees. Notice, "He answered them, and said — "It was the Pharisees who asked Him the question. Were they in the CHURCH? No, never! If one thinks the Kingdom is the CHURCH — and the Kingdom was "within" the Pharisees — was THE CHURCH within the Pharisees? Such an assumption is rather ridiculous, now, isn't it? But Jesus was speaking in the Hebrew or the Greek language. At any rate, Luke wrote these words, originally, in the Greek language. He did not write the words "within you." The Greek words he wrote were mistakenly translated into the English words "within you." If you have a Bible with the marginal references, you will notice that this is corrected in your margin to read "in the midst of you," or "among you." If your Bible is a Moffatt translation, you will notice that the translation recognized that Jesus was talking of His reign or rule, at the head of government. This is the Moffatt translation of the same verse: "He answered them, "The Reign of God is not coming as you hope to catch sight of it; no one will say, 'Here it is' or 'There it is,' for the Reign of God is now in your midst." Jesus was not talking about a Church soon to be organized. He was not talking about sentiments in the mind or heart. He was talking about His REIGN, as the Messiah! The Pharisees were not asking Him about a Church. They knew nothing of any New Testament Church soon to be started. They were not asking about a pretty sentiment. They knew, from the prophecies of Daniel, Isaiah, Jeremiah and others, that their Messiah was to come. They overlooked completely the prophecies of His first appearing as the "Lamb of God," to be slain for the sins of humanity — being born as a babe, growing up, being rejected and despised by them, as recorded in Isaiah 53. They looked only to the prophecies of His second coming as the all-conquering and ruling KING. Jesus set them straight. He explained that it would not be a local, or limited Kingdom for the Jews only. It would not be merely one of many human and visible kingdoms which men could point out or see, and say, "This is it, here"; or "that is the Kingdom, over there." But He, Himself, was born to be the KING of that Kingdom, as He plainly told Pilate (John 18:36-37). The Bible uses the terms "king" and "kingdom" interchangeably (see Daniel 7:17-18, 23). The KING of the future Kingdom was, then and there, standing in the midst of them. And in the language in which He spoke to them, that is precisely what He said — as the marginal rendering and other translations state. Jesus distinctly said that those Pharisees would not be in the Kingdom of God. To them, He said: "There shall be weeping and gnashing of teeth, when ye (you Pharisees) shall see Abraham, and Isaac, and Jacob, and all the prophets, in the Kingdom of God, and you yourselves thrust out. And they shall come from the east, and from the west, and from the north, and from the south, and shall sit down in the Kingdom of God" (Luke 13:28-29). Now continue: "He said, therefore, A certain nobleman went into a far country to receive for himself a Kingdom, and to return" (Verse 12). Christ is that "nobleman." He is speaking of His ascension to the throne of God His Father, in heaven. Notice, He went there to be given rulership of the Kingdom — to receive the Kingdom. Notice, too, He is to return, when He has received it! He has not yet returned! Other Scriptures explain this. We will turn to them a little later. Now Jesus Christ was born of the tribe of Judah. The promise of the "Sceptre" — or kingly tribe, from which Messiah was to be born — was divinely given to Judah. Consequently when it is stated that Christ "came unto His own, and His own received Him not," it is speaking of His having come to the Jews of the Kingdom of JUDAH, dwelling then in Palestine, with its capital still at Jerusalem. At that time the TEN TRIBES had migrated from Assyrian captivity northwest across Europe. They were far away, had lost their identity, were speaking a different language. It was then 700 years after their captivity and removal from northern Palestine. So it becomes plain that the ten servants of the parable, to whom He gave the ten pounds, represent the TEN TRIBES, who had become known as the LOST Ten Tribes. After the Jews rejected Christ, He sent His original apostles to the "LOST sheep of the HOUSE OF ISRAEL" — and the term "House of Israel" always applies, after the division, to the ten-tribed kingdom — never to the Kingdom of Judah — or, as often called, the House of Judah. Now notice in verse 17, the one who had gained ten pounds is given authority to RULE CITIES" have thou authority over ten cities!" To the one who had gained five pounds, he said, "Be thou also over five cities." That is plain! Christ ascended to the throne of God in heaven. God is Sovereign over the entire universe. This vision shows God Almighty, Father of the resurrected living Christ, conferring on Christ dominion. Dominion means sovereign or supreme ruling authority. Also given to Him was "a kingdom." Where is that Kingdom to be? It says "a kingdom that all people, nations, and languages, should serve him." The people, and the nations speaking different languages, are here on earth. He is given dominion over ALL NATIONS the whole world! Jesus Christ makes that plain. It is Christ who is speaking in Revelation 3:21, and 2:26-27: "To him that overcometh will I grant to sit with me in my throne, even as I also overcame, and am set down with my Father in His throne." The Father's throne is in heaven — where Jesus Christ is now; but Christ's throne, in which the saints shall sit with Him, is the throne of David, in Jerusalem (Luke 1:32). After His resurrection, on the Mount of Olives at the very hour of His ascension to heaven, Jesus was explaining to His disciples how they would receive the inspiring God — begetting POWER of the Holy Spirit on the approaching day of Pentecost. "And he said unto them, It is not for you to know the times or the seasons, which the Father hath put in His own power. But ye shall receive power, after that the Holy Spirit is come upon you: and ye shall be witnesses unto me both in Jerusalem, and in all Judaea, and in Samaria, and unto the uttermost part of the earth. And when he had spoken these things, while they beheld, he was taken up; and a cloud received him out of their sight" (Acts 1:6-9). However, though we do not, even now, know the day or the hour, we do know, from God's prophecies, that it is today very near! Notice this, in Luke 21:25-32: He had been foretelling the world events, right now beginning, leading to "distress of nations" in world troubles and world wars, "with perplexity" — "men's hearts failing them for fear, and for looking after those things which are coming on the earth" — world trouble such as never before experienced. 'When ye see these things come to pass, know ye that the Kingdom of God is nigh at hand. Verily I say unto you, this generation shall not pass away, till all be fulfilled." This world trouble began in 1914, with World War I. There was a recess from 1918 until 1939. We are in a second recess now — although we are in what we call "COLD WAR." But now at last we have nuclear energy. We have hydrogen bombs stock-piled in such power and volume that they could blast all human life off this planet several times over. There are two other destructive weapons today in existence, either of which could erase humanity from the earth. Today world-famous scientists say only a super world-government can prevent world cosmocide. Yet MEN cannot and wilt not get together to form such a world-ruling government. It's time we face the hard, cold, realistic FACT: humanity has two alternatives: either there is an Almighty, all-powerful GOD who is about to step in and set up THE KINGDOM OF GOD to rule all nations with supernatural and super-national FORCE to bring us PEACE — or else there will not be a human being alive on this earth 20 years from now! If the deceived religionists who think the CHURCH is the Kingdom of God were right, and there is not going to be any supernatural and all-powerful WORLD GOVERNMENT which is the Kingdom of God, then humanity is utterly without HOPE — there will not remain a living human in 20 more years!